I talk and text with so many people in a day and I consider my blog writing a form of communication as well therefore I often forget who I tell what and in what form I tell it. That Lulu Lemon has an in-house tailor? You can even have your work-out tops shortened if you find that they are too long. I didn’t know this so if you did and didn’t tell me, that isn’t very nice. I decided yesterday that walking into Lulu Lemon is like being in Disney World and walking into the Disney gift shops. You are immediately brain washed into thinking you need everything when in reality, you just don’t. I don’t need this bag just like you don’t need the Minnie Mouse beach cover up with matching sandals to coordinate with the Disney dish towel set which pairs nicely with the Mickey kitchen utensils. Ugh but the bag is cute and functional and water proof and did I mention cute. Did I tell you that asking a girl out in the fifth grade and her saying yes really just means your instagram profile will now include your “girlfriend’s” name with a heart next to it? Welcome to the social media generation. I decided it’s not fair that kids today have their own cell phones and never need to stress over calling a boy’s house and having the mother answer where you choke and hang up due to fear and embarrassment. Did I tell you that I got a new pair of running shoes? Clearly I have a color theme which is so not done on purpose. I burned through my latest pair of yellow Adidas Energy Boosts fairly quickly but that’s what happens when you run a lot of miles each week, especially when those miles are taking place outdoors. I got lucky that the Energy Boosts were left in my size in dark pink this time around. As I said in Tuesday’s post, proper running shoes are crucial. You can’t wear poor fitting sneakers and you certainly cannot run in worn out, too-many-miles-on-the-soles sneakers and expect to run happy. Sometimes your knees hurt, hips ache, calves burn, heel hurts, hamstrings pull to the point where you think you are injured or just not made for running when in reality, nothing is wrong other than you trying to run in the wrong pair of sneakers. Did I tell you that I am contemplating giving away my pink jean shorts? I am not ready to graduate to mom shorts but I decided the pink ones are the shortest and maybe need to be retired to someone who can wear them age appropriately. My friend’s daughter would like them. She is nine. Makes sense. Did I tell you that I am currently obsessed with corn and recipes that contain corn? It started last week when I kept eating my favorite salad. Corn. I just want corn. I spotted roasted corn on someone else’s table the other night at Rosa Mexicano and became sorry we ordered the roasted plantains as a side dish. Although those plantains were good. Like really good. I need to start buying plantains. And while on the topic of recipes I need to make, now that I have an abundance of blueberries, I must make Davida’s Roasted Rosemary Brussels Sprouts with Blueberries. It would help if I had Brussels sprouts in the house. Why can’t I ever have every ingredient that I need at the same time? Do you suddenly crave random foods for days on end? Did you used to freak out calling a boy’s house (or a girl’s house) when you were a kid? 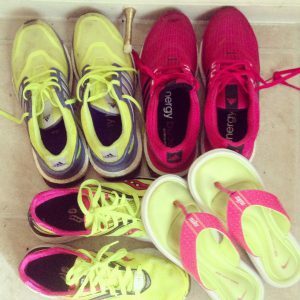 How do you usually tell you are due for a new pair of running shoes? I can usually feel the front of the shoes are worn through and this time around, I had heel pain in both feet. My life is a story of randomly craving foods. Alex asked (at lunch) yesterday if we should get sushi for dinner (I had been asking of late) and I was all, nah. Then, 5:00 pulls around and I am like SUSHI FOR DINNER. Also, roasted corn, particularly mexican corn, is amazing. AMAZING. You know, I haven’t had sushi now in quite a while. This is so unlike me! I’ll pass on the Minnie Mouse cover up, but that bag is super cute. I try to avoid walking into Lulu when I’m in the mall because I don’t think I’ve ever walked out empty-handed… I just don’t have the willpower. But they DO have pretty high quality things that tend to last forever if you take care of them right, so I consider it a good investment. And I want corn too. And roasted marshmallows. But for now… coffeeeeeeee. I can happily admit that I walk in and out of Lulu more often than not without buying anything. I just don’t need so many work out tops and pants. Although maybe if I bought more, I could laundry less often. I could use the Lulu tailor for some of the tops that are way too long for me. I do ok with their pants because I buy the cropped versions which I can wear as full length lol. I never feared calling a boy’s house as much as I feared them calling MY house and my dad answering … I think my blood pressure just rose even typing that! Luckily I’m cheap enough that I can walk in and out of Lulu without buying something. Target on the other hand … will power? what’s that? That’s so cool Lulu has an in-store tailor. I had no idea! I know I need new shoes when I get a pain in my foot that feels scarily like plantar fasciitis, but it goes away as soon as I get new shoes, thankfully! I didn’t know either about the tailor! You would think it would be a feature they would mention. Oh, you just made me totally miss Rosa Mexicana – we use to go to the one in union square for brunch…loved the sangria! Random question.. do you know after how many miles or months you normally change sneakers? I have been feeling a little sore ness and thought maybe it was because i have been running less since the 1/2 marathon.. buttt maybe I need new sneakers !?!? I am going to address this more tomorrow but shoes should last anywhere from 300-500 miles. I find with me that around 300-350 miles, I feel it. My Adidas do last a bit longer than the other brands I have worn but out of nowhere I will just run one day and know the shoes are done. The cushioning is gone and the fronts of the shoes are pretty worn through. For someone else, they may not notice it but I do and don’t like it. If I hold out, I am just not comfortable and have experienced nagging pains or just feelings that aren’t comfortable in various places (shins, hamstring, feet). Do you know how many miles you have put on your shoes? When did you get them? Very possible it is time. My advice is to get the new pair. You will need them eventually. Try on your old pair and new pair. You may notice a huge different right away that the old pair is truly burned out, or, if not, just start working the new pair into the rotation until the old pair is truly finished. Your shoes are so bright and cute! And yes, there does seem to be a theme. I’ve never made the jump to going to an actual running store to buy a good pair of running shoes. I’m just not really a runner … I “wog” (walk/jog) but my main exercise is the elliptical and stationary bike, and I wear slippers instead of shoes. I am loving Zumba lately, and I do need to wear shoes for that. I never know if I have the “right” shoe and I never know when I’ve worn it out (until it is OBVIOUS). Nikki@will run for pizza recently posted…Running on 2×4′s, boxing, and an important decision.